On December 7, 2018 Councilmember Harris-Dawson’s staff joined LAPD at the new Kaiser Permanente Baldwin Hills facility to update the community about the recent swastikas that defaced the “Our Mighty Contribution” mural along Crenshaw Boulevard. Councilmember Harris-Dawson is working with LAPD to ensure perpetrators caught will be punished to the full extent of the law. To date, no suspects have been apprehended, but LAPD seeks community assistance by encouraging tips at 1-877-LAPD 24-7. In collaboration with the Baldwin Hills Crenshaw Plaza, the Council Office hosted its 4th annual Winter Wonderland celebration. This event featured live performances, food, and toy giveaways for families. The Eighth also supported holiday gatherings hosted by the View Heights and West 63rd Block Clubs, Park Mesa Heights Neighborhood Council, and the Baldwin Hills HOA. 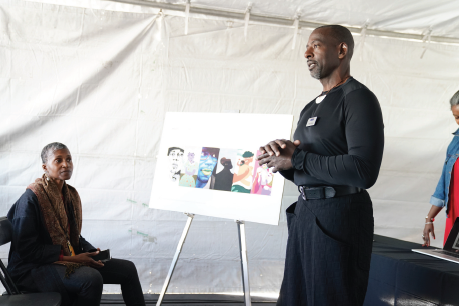 On December 8th, Councilmember Harris-Dawson partnered with architectural firm Perkins + Will to host an Influencers Screening and unveiled renderings of the acclaimed Destination Crenshaw Project. Destination Crenshaw is a 1.3 mile long open-air, public art, and cultural experience that will tell the previously untold stories of the extraordinary contributions Black Angelenos have made to Los Angeles and the world. The project will feature fresh architectural designs that capture the innovative and trailblazing spirit of Black Los Angeles. Unlike traditional museums, Destination Crenshaw won’t be bound by walls or ceilings. The project will span Crenshaw Boulevard between 48th and 60th Streets and feature 11 new parks, hundreds of new trees, and permanent and interactive art installations to celebrate the legacy of Black Los Angeles. The December event allowed residents, local elected officials, and other dignitaries to gain a more in-depth look at what the project entails via three-dimensional renderings of specifics. The event featured six stations that held presentations from Perkins + Will staff. These presentations opened a direct dialogue between community members, Perkins + Will, and the Council Office by encouraging attendees to comment and ask questions which will help inform the project which is slated to be completed in 2020. The next community event for Destination Crenshaw will be held in the spring.